It is always a bit odd, when reading an erudite, readable and well-researched book, to happen across a blunder of such proportions that one has to pause for a double take and a moment for the brain to shout out (not always silently) ‘rubbish’! This happened this week while dipping into a book I’d had for years. It was A History of London Life, by R.J. Mitchell and M.D.R Leys, Longmans, 1959. After enjoying a perambulation around 400 years or so of London and its trades and lifestyles I was taken aback by the sentence: ‘The first underground railway … was opened in 1863 and ran between Paddington and Farringdon Street, with carriages of open trucks’. Now there are books where I expect to see this kind of rubbish but this was not one of them. Mitchell (not of course the Spitfire designer) is described as a distinguished scholar obtaining a Royal Historical Society medal and other prizes, and Leys was a senior history tutor at Oxford. No doubt this was a genuine error, perhaps inspired by one of the well-known engravings from the Illustrated London News (ILN), but it almost beggars belief that anyone with any knowledge of Victorian times thought that fare-paying passengers on a ‘proper’ railway were routinely conveyed in trucks as late as the 1860s and didn’t feel that the suggestion should at least be checked! Startled by this, I now became wary of other information in the book. It is hard to check every single fact personally, but that is no excuse for suspending common sense. The book is now back on my shelf, unfinished, with the equivalent of a large red warning label associated with it. 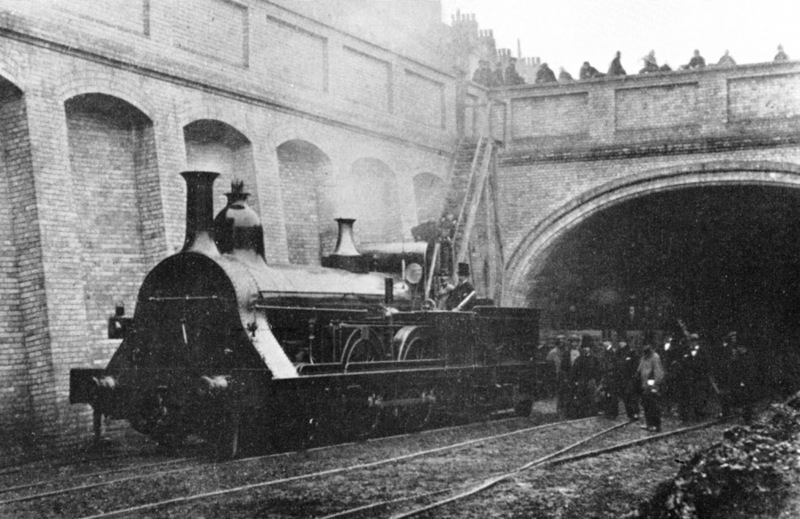 Just for the avoidance of doubt, I need to remind readers that when the Metropolitan Railway opened on 10 January 1863, all day-to-day operations were placed in the hands of the Great Western Railway which provided a dedicated fleet of broad gauge locomotives and carriages (conveying all three classes of passenger). The carriages were commodious and incorporated gas lighting and on practical grounds alone it is inconceivable that such an operation could have been conducted using 4-wheeled open trucks. These authors are not the first to make this error, though they may be the most reputable. 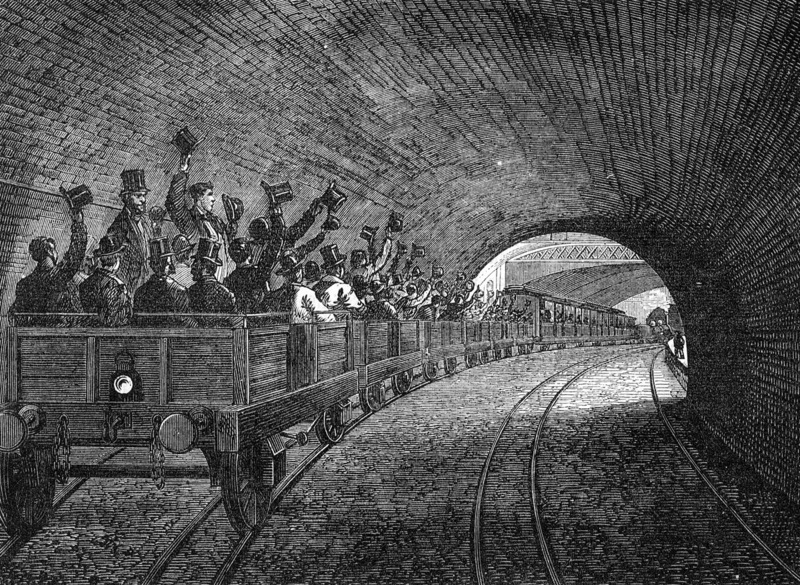 The construction of the first underground railways ticked all the boxes that are required to make a good and enduring news story and therefore created a lot of coverage. The ILN reported construction extensively, including a number of the various inspection tours that were arranged. For inspection and publicity purposes a number of visits were arranged and the later ones involved the use of trains with open trucks so the engineering could be viewed to best effect. The trucks and motive power was provided by the contractors, either Smith and Knight (the section west of Gower Street) or John Jay (for the eastern portion). It is now evident that these inspection tours are (after 150 years) causing some confusion, with no source I’m aware of recording them all and some very odd things being suggested. For example (and it is just one of many) Underground – How the Tube shaped London, by Bownes, Green and Mullins, Allen Lane 2013, suggests that the only known photograph of a Metropolitan trial trip on 24 May 1862 is mysterious as ‘no trips were reported on or around that date’. This referred to the relatively well-known photo of a number of dignitaries sitting in a railway truck, including W.E. Gladstone, reputedly at Edgware Road station. This trip was in fact recorded and I thought it helpful to list all the other ones I could find as there were perhaps more than many people think. 1. Gladstone (then Chancellor of the Exchequer) first visited the Metropolitan workings on 1st February 1861. I do not have any detail, but it is likely there was an entourage of some kind. Construction had been in hand less than a year and it would not then have been possible to travel underground from one end to the other on foot. 2. Inspection on 28th November 1861. This appears to have been precipitated by a desire to demonstrate Mr Fowler’s smokeless broad gauge engine (later nicknamed Fowler’s ghost); this was constructed by Robert Stephenson & Co and was built as a trial locomotive, delivered in 1861. The Met chairman, Mr Wilkinson, invited a party along to Paddington for the viewing shortly after midday. The party boarded trucks that were hauled by this engine to Edgware Road, which was in the open, and during the trip neither smoke nor vapour were emitted. On the way back the engine was in part allowed to operate normally whence prodigious smoke and vapour was created that almost completely dimmed the lights in the tunnel that had been installed (the tunnels were at first lighted by gas). The party then walked along the workings to Kings Cross (this was evidently very difficult and dirty in places where tunnelling was far from complete. The party then lunched at the Great Northern Hotel, King’s Cross, presumably having been afforded the opportunity to clean up first. 3. On 2nd April 1862 the last mining at Clerkenwell was completed and construction of the terminus was in hand. This was a landmark and may have given rise to the next inspection, which took place on the 5th April 1862, reported in press on 5th and 6th. Descriptions state that the primary reason for the visit was to inspect the stations and that the party comprised 200-300 Gentlemen, including members of both houses, engineers, railway contractors, shareholders, aldermen and common councilmen. This was first through journey. The party met at Coppice Row, near Farringdon Street at the mouth of the tunnel, and approached the track by means of ladders. They were conveyed in ten trucks, drawn by a team of horses, through the tunnel to Frederick Street, the tunnels illuminated by candles ‘to make the darkness visible’. After that the way was largely in open air to still-roofless Kings Cross station where the junctions were inspected. The trucks were then drawn up one of the Great Northern link tunnels with an ordinary locomotive to enjoy the smoke and steam produced, of which on the steep up gradient there must have been a lot. On their return, the horses were then reharnessed for the next leg, to Gower Street, here it was necessary to proceed for a short distance by street before re-entering the railway to walk through the tunnel to Portland Road and Baker Street (this section was described as complete). Here a ‘smokeless locomotive’ was attached; if the report is accurate this can only have been the Stephenson machine as the GWR designs did not begin to arrive until June. The Times referred to it being one ‘of Mr Fowler’s patent’. The party then proceeded to Paddington under mechanical haulage. Doubtless a lunch followed. The date of this image remains to be determined beyond doubt, but historian R.M. 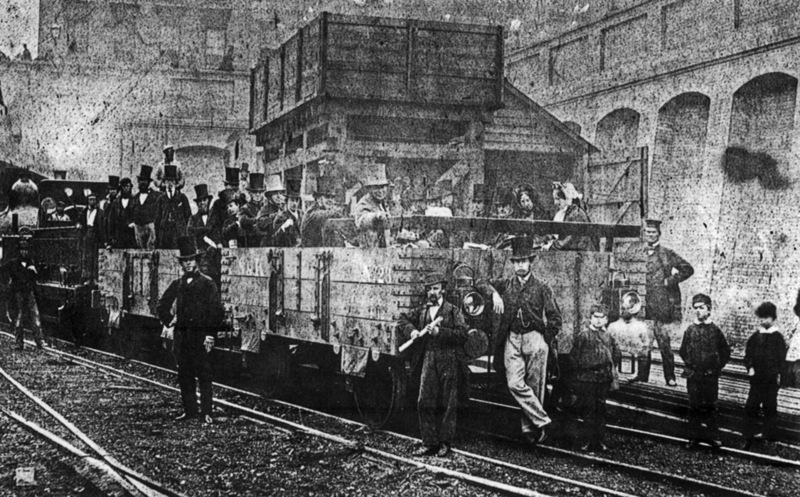 Robbins (who looked into the matter of this loco) felt it was 1862, and the photo is clearly of a demonstration of some kind. If it were 1862, the April trial is at least likely. On the other hand it would have been very difficult to handle such a large party dispersed over the track, as shown, so the November 1861 trip is a distinct possibility too. 4. 24 May 1862 Gladstone attended with his wife and a party of others including a number of other members of the government and were moved around (at least in part) in specially equipped trucks. Visit included lunch and various speeches. This is the visit widely photographed. This is the better known of two images taken of this inspection party this day and it is clear from studying both that the loco is unquestionably the Stephenson machine (as in earlier photo). The GWR machines were not even ready in May. If that is the case, then with a photographer on hand it could be the same occasion as the previous photo. Another image of the same event, though the train is now just east of the station. The structure behind the train is a water tower. The presence of the youngsters is a slight surprise. 5. The next inspection was on 4th August 1862, where it was reported directors and some other interested parties were taken up and down line using Mr Fowler’s loco (this is ambiguous and suggests the Stephenson machine, but the purpose-built GWR locos were then available and seem a far more likely candidate; these were designed by Gooch, but that would not have discouraged Fowler from taking the credit). The trip was supposed to start at Bishops Road at 3pm, but eventually began at 5pm following misapprehension about how long the loco needed to get into steam (another reason for thinking it was the new GWR machines). The party therefore inspected the works at Paddington in more detail than had been expected, including the large bridge just west of the platforms. The rolling stock used this time included some of the special GWR carriages provided to work the line (the reports do not mention trucks at all). By then the tunnels were being lighted by gas and the pipe and sewer crossings were visible. 6. 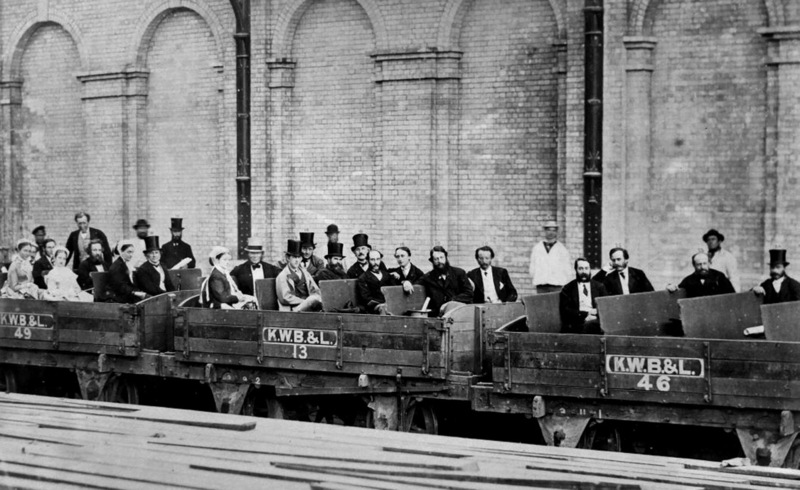 30th August 1862 where it is recorded that 600 shareholders and VIPs were conveyed using four large carriages and open trucks with seats. Two smokeless engines Tsar and Mogul provided haulage (these were definitely the locomotives designed for Met use by the GWR). On return journey the train stopped at Edgware Road for lunch. An ILN print was produced of the occasion (13th September issue). 7. October (exact date not yet established). First Board of Trade inspection (which found certain matters wanting). 8. Times referred to visit 1st November. Much detail was given of the line by The Times’ reporter, but nothing is said of actual visit. It is likely to be a press preview at a time when opening in December was expected. 9. Gladstone visited the Met workings again on 18th November 1862, describing event as his third expedition. Little detail is given, but again it is unlikely he travelled alone. By then the railway was all but complete and opening was thought imminent. 10. Board of Trade formal inspection. Failure to gets its certificate meant postponing the planned opening celebrations on New Years Day (not clear when passenger trains would have started). 11. Further Board of Trade inspection 27th Dec 1862 with trial trips from Monday 29th December. 12. Final Board of Trade re-inspection, 3rd January 1863. 13. On 9th January 1863. 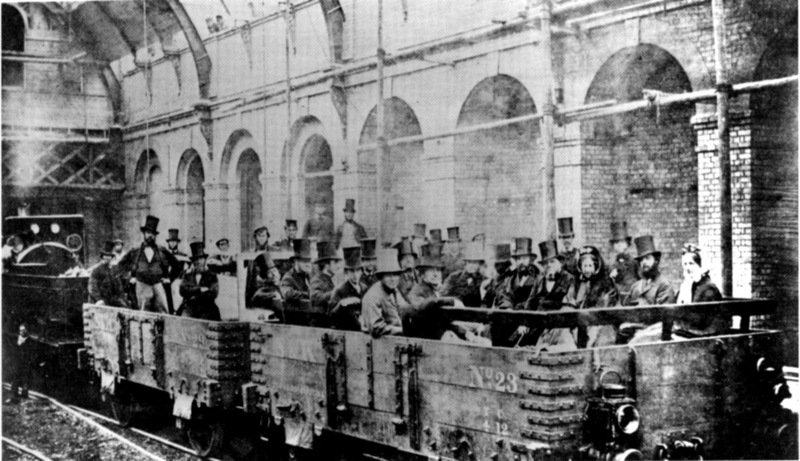 Several trains ran in succession allowing invited guests to inspect the stations on way to the formal lunch at Farringdon to celebrate opening of line to the public on the following day. Trial trips HAD been run throughout the previous week but not carrying people. I must also draw attention to a reference on page 190 of Alfred Rosling Bennett’s Chronicles of Boulton’s Siding (1927), where he referred to his uncle and girl cousin who had walked through the tunnels with a party during the Metropolitan’s construction, from Bishops Road to Baker Street, and, on the way, passed a fearsome contractor’s locomotive going about its business. This sounds wholly inconsistent with any of the inspection trips already described and opens up the possibility that there were even more of them, available perhaps to interested members of the public. More digging to be done, I fear. I now need to turn to another photograph. This has also done the rounds and I am aware that it has been misunderstood to be the Metropolitan photo of May 1862. Indeed the Proceedings of the Institution of Civil Engineers says so in their reproduction of the image. However, that cannot be. The image shows trucks marked K.W.B.&L. The Metropolitan trucks were, of course those of Smith & Knight. The trucks also seem to be much smaller, almost certainly because they were standard gauge (the Met ones were broad gauge). I believe the initials to represent Kelk, Waring Brothers & Lucas, the contractors for the Metropolitan District Railway (and Metropolitan Railway extension to South Kensington) and that the photo must be around 1867 or early 1868 (in fact the company did not adopt that particular name until 1867, so it cannot have been earlier). I would not care to guess the location, but it must be between Praed Street and Victoria. Mr Gladstone features again, he was a director of the Metropolitan District and made a loss on the investment. It would be very interesting to know if there are any more photos. The above photo remains to be dated beyond doubt, but cannot be the single occasion I have so far identified for a trial trip. I have established there had been an earlier trial trip on 23rd August 1866, beginning at Westminster Abbey and working west. The visit was organized by the contractors, Peto & Betts, Waring Brothers and Kelk, and party comprised the directors of the Metropolitan and Metropolitan District companies ‘and some other gentlemen’. The party made its way slowly all the way to Paddington inspecting every station and other significant works. These included the brick kilns at Earls Court that were producing the 50 million bricks required for the stations and tunnels, apparently using local clay. The Times recorded some of those present (and who attended the subsequent lunch), including Lord Devon (MDR chairman), Mr W.H.Smith, several MPs and the Metropolitan Railway’s traffic manager (but not Gladstone). No mention is made of any train (the way was not even complete) and the entire journey seems to have been taken on foot.Main sources. 2. The Underground Story, Hugh Douglas, elaborated by The Observer 1st Dec 1861. 3. Widely reported in (amongst others) The Times and Manchester Guardian. Reference to GWR locos arriving from Jackson, London’s Metropolitan Railway. 5. Reported The Times on 6th August. 7. This is referred to in The Underground Story, Hugh Douglas. Cannot yet corroborate. 8. The Times 3 November 1862. 10. The Observer 14 December and 21 December. 11. The Observer 28 December 1862. 12. Jackson, London’s Metropolitan Railway. 13. The Times report of ceremonial events 10 January 1863.